Technology improved over many years to enhance confidence, comfort, and convenience. Global reach is to anticipate their latent needs. Environmental management to achieve simultaneous environmental conservation and business growth. These three elements are our strengths. 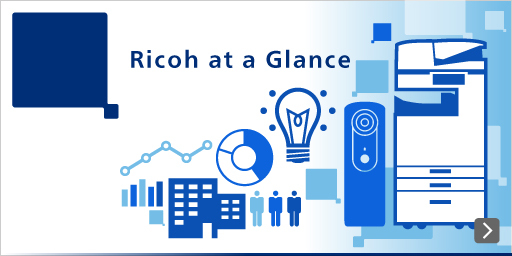 The Ricoh Group continues to innovate by merging its core technologies of image processing, optics, chemistry, networking, and software with fresh ideas and the latest technologies. Machine vision*, the technology for visual inspection and judgment without human involvement using the installation of sensor modules, is used in the inspection stage during the development of automated production facilities. Ricoh has been refining this technology since the late 1970s. 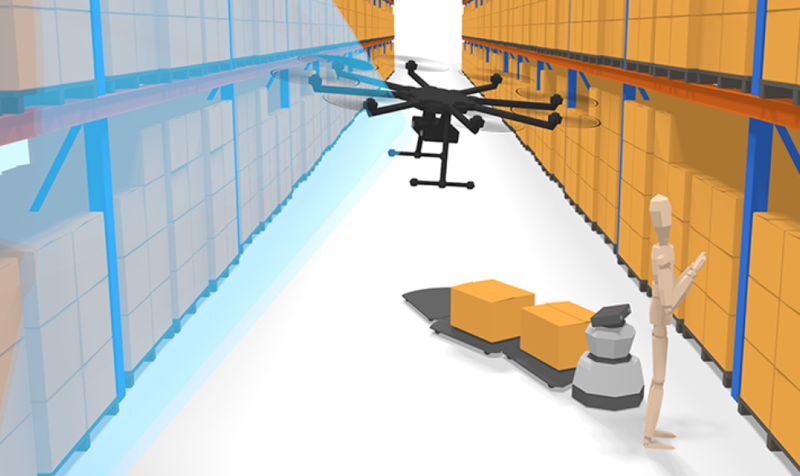 By merging machine vision with drones, new value is created. Ricoh, The University of Tokyo, and the drone integrator Blue Innovation Co., Ltd. jointly developed a new super-wide stereo camera, which acts as the eyes of the drone. Generally, the auto flight mode of a drone requires GPS. In a room where GPS signals cannot be received, normally the only option is manual control, We, however, achieved a fully automatic flight. With the commercialization of this technology, security for guarding facilities and warehouses and the inspection of dangerous large-scale infrastructure facilities (such as bridges and plants) should be greatly enhanced. 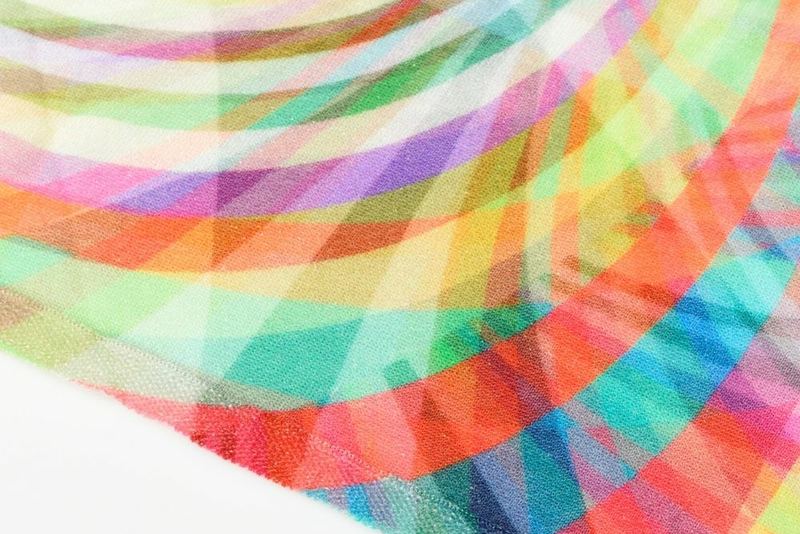 Ricoh offers industrial printing services for printing on diverse media (e.g. building materials, clothing, paintings, food, medical supplies, etc.) in addition to paper by combining inkjet head and ink materials technologies, which are Ricoh’s strengths. Users can print one original illustration on wallpaper, clothes, or even on the foam of a caffé latte. Totally different from traditional cameras, RICOH THETA, can capture an entire 360° scenes around the photographer with a single shutter release. This product is a fruit of the merger of Ricoh’s unique optical technology with its image processing technology. 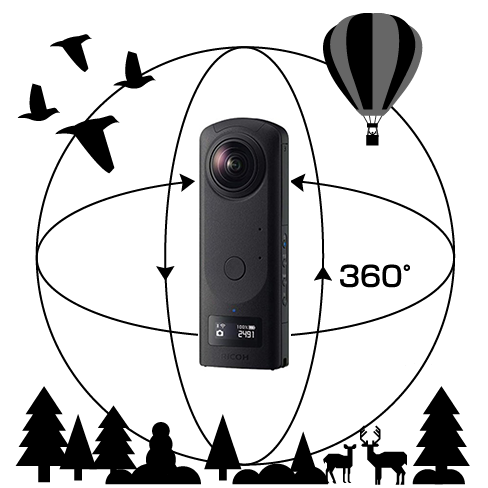 RICOH THETA is expected to be utilized in a wide range of applications, including use as an automotive camera. The Ricoh Group has R&D sites in Japan, the United States, India, and China, and these sites cooperate globally. They explore market needs and conduct research and technology development attuned to regional characteristics. 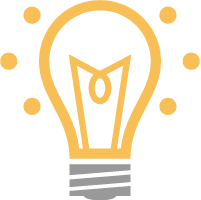 Ricoh also facilitates efficient development of cutting-edge technologies through open innovation that actively draws on the capabilities of universities, research institutions, and companies. In addition, Ricoh actively participates in Japan’s Funding Program for World-Leading Innovative R&D on Science and Technology and in joint R&D activities with universities and incorporated administrative agencies. The Ricoh Group consistently earmarks about 5 - 6% of consolidated sales for R&D to ensure a steady stream of innovation. In fiscal 2016, R&D expenses reached 118.5 billion yen, about 5.3% of sales. Of this amount, 13.5% (16.0 billion yen) went into basic research. Intellectual property—the fruit of our R&D efforts—is one of the most precious resources we have for securing a competitive market advantage. In recent years, Ricoh has maintained its position within the top ten in terms of the number of patent applications in Japan. Ricoh has also increased the number of its patent applications overseas. In fiscal 2016, we published 3,584 patents in Japan and we retain the rights to more than 24,000 patents in Japan and more than 24,000 patents overseas.